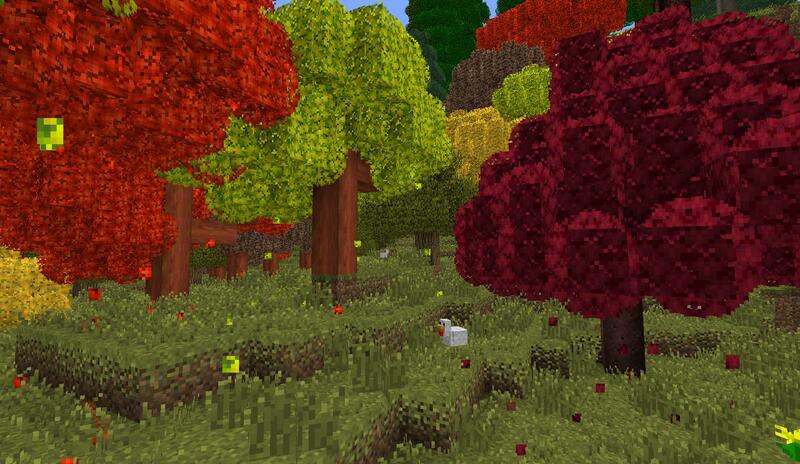 ExtrabiomesXL is a collaborative open source mod for Minecraft which adds new biomes and an assortment of natural blocks and items that enhance gameplay and make exploring fun and interesting. If you have support issues, questions or anything else, please refer to our official site to consult further information and leave comments. ExtrabiomesXL depends on Minecraft Forge. We are currently using 10.13.4.1481, which can be found here. Forge is an API, or program layer, that provides many powerful features for modding Minecraft in ways that allow compatibility and interaction between mods. A list of resource packs and texture packs which support ExtrabiomesXL can be found on our wiki. We can't guarantee all of these will be up-to-date, however. ExtrabiomesXL team member gwydion0917 has utilized Custom Stuff 2 to add special red rock versions of furnaces, buttons, pressure plates, ect. It can be found here. He has also given the same treatment to ExtrabiomesXL's custom wood types, which can be found here. ExtrabiomesXL is currently available in English, French, German, Italian, Polish, Portuguese, Russian, Simplified Chinese, Spanish, and Swedish. As ExtrabiomesXL updates with new content, however, we can't guarantee these localizations will remain up-to-date. We'd greatly appreciate any assistance in ensuring all of ExtrabiomesXL's localizations are up-to-date and accurate. A list of the localization files can be found here. Always feel free to add new languages! Our localizations are done by hand by speakers of the select language for utmost quality, so please no Google Translate. Thank you! You are free to distribute ExtrabiomesXL in your modpack. There are plenty more people who have contributed to the mod than the ones listed on CurseForge. Please use the links above for more proper credits. A list of frequently asked questions is available at our wiki. Apparently the mod is being rewritten by the author. No point in my continuing. Everyone wants a 1.12.2 version, so I've started porting the mod to 1.12.2. I'll let you all know when I'm done. Thanks valoeghese! We will all be very grateful to you for keeping the memory of this mod alive. You do know that this mod is being rewritten, right? The mod is being updated by the own author, dude! Currently developing a new modpack and im scouring for any and all mod updates or replacements. Having this one extra mod from hexxit will keep my modpack as authentic as possible withthe others im merging together! Really? I use that mod but they are completely different! We are fans of ExtrabiomesXL, not Biomes O' Plenty. Do you have discord channel for watch any updates? If it's not that hard, you do it.